The aetiology of several human diarrhoeas has been increasingly associated with the presence of virulence factors rather than with the bacterial species hosting the virulence genes, exemplified by the sporadic emergence of new bacterial hosts. Two important virulence factors are the Shiga toxin (Stx) and the E. coli outer membrane protein (Eae) or intimin, encoded by the stx and eae genes, respectively. Although several polymerase chain reaction (PCR) protocols target these virulence genes, few aim at detecting all variants or have an internal amplification control (IAC) included in a multiplex assay. The objective of this work was to develop a simple multiplex PCR assay in order to detect all stx and eae variants, as well as to detect bacteria belonging to the Enterobacteriaceae, also used as an IAC. The wecA gene coding for the production of the Enterobacterial Common Antigen was used to develop an Enterobacteriaceae specific qPCR. Universal primers for the detection of stx and eae were developed and linked to a wecA primer pair in a robust triplex PCR. In addition, subtyping of the stx genes was achieved by subjecting the PCR products to restriction digestion and semi-nested duplex PCR, providing a simple screening assay for human diarrhoea diagnostic. According to WHO diarrhoeal disease is the second cause of death of children less than 5 years old, killing around half a million every year . Hence, easy to implement diagnostic tests are highly relevant for patient care as well as for food and water monitoring. Once associated only with specific bacterial strains or serotypes, some diseases have been caused by new strains that were not previously identified as food/water-borne pathogens. A major mechanism associated with the emergence of pathogens is horizontal gene transfer enabling the sudden acquisition of virulence factors [2, 3] also between phylogenetically distant bacterial genera . Among the numerous known virulence genes, stx and eae play a major role in the virulence of various enteric pathogens members of the Enterobacteriaceae [5–7]. Detecting the presence of these virulence genes is now a common procedure for tracking the associated aetiologic agents although other markers have also recently been used to monitor diarrhoeic E. coli . The Shiga toxin producing E. coli (STEC) comprises the enterohaemorrhagic E. coli (EHEC) pathotype and is defined by the presence of the stx gene. Two main types of this virulence factor have been defined, stx1 (quasi identical to Stx produced by Shigella dysenteriae) and stx2, both of which are further divided in several subtypes . Most STEC detection methods rely on the identification of serotype O157H7. As more than 50% of STEC infections may be caused by non-O157H7 strains, the need for diagnostic methods detecting all types of STEC has been emphasized [10, 11]. The gene eae coding for intimin has been found in enteropathogenic E. coli (EPEC), EHEC, E. albertii and Citrobacter rodentium . Several multiplex polymerase chain reaction (PCR) methods for the detection of virulence factors and serogroup markers associated with human gastrointestinal diseases have been previously developed which include the presence of an internal amplification control (IAC) [13–16], or of an indicator organism such as E. coli to provide a positive control [17–21] (see Additional file 1). E. coli belongs to the Enterobacteriaceae, a group which includes the total coliforms (TC) and most enteric pathogens and is described as a “general (process) microbial indicator”  used for assessing the efficiency of food and water treatment. Therefore, in the present method, the Enterobacteriaceae was chosen to serve both as a general microbial indicator of sample contamination, and as a positive control for the multiplex PCR when tracking the presence of stx and eae genes. The “universal” primer design for the detection of stx and eae virulence genetic elements aims at detecting all variants of the gene regardless of the bacterial host species whereas other “universal” stx and eae primers, aim at E. coli (Additional file 1). In addition, sequence variability within the stx PCR product was exploited in order to develop a nested PCR and a restriction digestion protocol for typing of the genes. To our knowledge it is the first time such screening “universal” stx and eae primers are used in a multiplex PCR with an Enterobacteriaceae IAC. For testing the multiplex protocol, the 23 bacterial isolates used are listed in Additional file 2. The bacterial strains were provided by The Norwegian National Institute for Health (Folkehelsa) and the Rikshospitalet University Hospital. Pure cultures were grown in 10 ml Luria Broth over night at 37 °C with shaking. Grown cultures were boiled for 10 min, and serially diluted in water before being used for PCR analysis. Alternatively, single colonies were picked from agar plates, suspended in water and used directly for the PCR. Sequence alignments were performed using the Multalin web site http://multalin.toulouse.inra.fr/multalin/ accessed 1 February 2018 . Primer design as well as restriction enzyme analyses were performed with Oligo 6.0 (Molecular Biology Insights, Inc., USA) software or performed manually using the alignments results and guidelines [24–27]. Amplicon product sizes and primer sequence are shown in Table 1. Samples (10 μl) were amplified in 50 μl final reaction mixtures using a BioTest Biometra or a TGRADIENT (Whatman-BiometraR) PCR thermocycler. For the semi-nested duplex PCR, a 1000-fold dilution of the triplex reaction was used. The buffered (1×) mixtures contained 0.1 mM nucleotides and 0.2 U of DyNazyme II (Finnzymes) DNA polymerase. The concentration of primers and MgCl2 for the triplex PCR and the semi-nested duplex PCR were as indicated in Table 1. For the simplex stx PCR, 0.1 μM of primers UstxU1 and UstxL1 and 0.01 μM UstxU3 and UstxL3 were used. Thermocycling conditions were as follows: 2 min preheating at 94 °C followed by 40 (triplex and simplex), or 25 (semi-nested duplex PCR) cycles of 94 °C for 15 s, 57 °C for 30 s and 72 °C for 60 s. PCR products were separated by electrophoresis on a 1.7% 0.5 × Tris–borate–EDTA agarose gel stained with ethidium bromide, visualized using 75 V and 25 mA for 1 h 30 min and then photographed under UV illumination. The reaction mixture contained 16 μl PCR products, 10 U BsrI restriction endonuclease (New England Biolab) with the provided NEB3 buffer in a total volume of 20 μl. Digestion was performed in PCR tubes at 65 °C for 2 h 30 min in the thermocycler after which 10 μl of the sample was analysed by electrophoresis as described for PCR amplification. A total of 45 different stxA gene sequences and 21 different eaeA gene sequences were aligned (see A1 and A2, respectively in ). The primers were aimed at detecting all variants of stx and eae, and thus were designed on the basis of the most conserved area of the DNA sequence alignment. An alignment of the universal degenerate Ustx primers with the most relevant primer pairs used in other PCR protocols is shown in Additional file 3. The triplex PCR was developed to simultaneously detect Enterobacteriaceae, used as an IAC, and the presence or absence of any variants of stx and eae genes. The triplex PCR was optimized varying annealing temperature, primer concentration and by testing additives or facilitators such as DMSO, glycerol, bovine serum albumin, formamide and MgCl2 which are reported to improve multiplex PCR [24, 29, 30]. Only increasing the concentration of MgCl2 from 2 to 3 mM improved results as shown in Fig. 1. The results from testing 19 pathogenic E. coli, 3 S. dysenteriae and 1 non-pathogenic E. coli, for specificity of the assay are shown in Fig. 2a and Additional file 2. 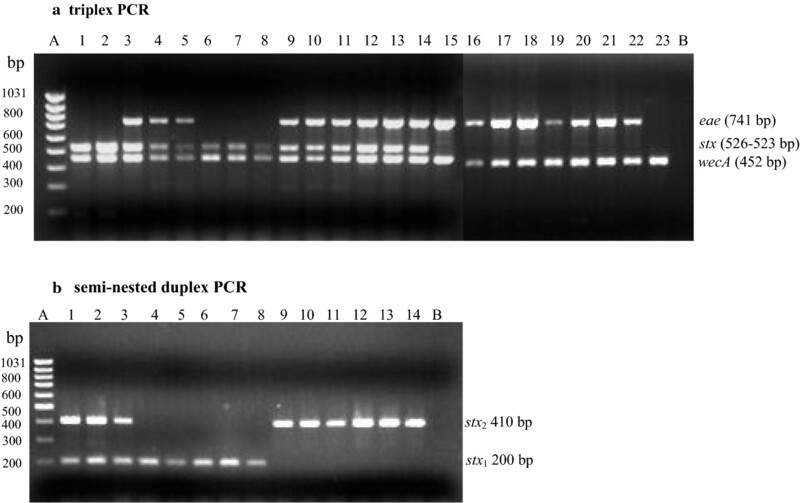 The semi-nested duplex PCR consisted of UstxL1, used as the reverse primer in the triplex PCR, and two new forward primers, Nestx1 and Nestx2. These two forward primers are complementary to stx1 and stx2 respectively and are located within the amplicon produced in the triplex. The products of the amplification consist of 200 bp and 410 bp for stx1 and stx2, respectively. The assay was tested on 14 strains containing stx1 or stx2, or both, and the results are shown in Fig. 2b. These results were corroborated by those produced by the restriction enzymatic digestion assay shown in Additional files 4 and 5. The result obtained after digestion with BsrI of the stx simplex PCR product is shown in Additional file 4. The fragment pattern enables the distinction of four different groups of stx variants, stx1c, stx1, stx2 + stx2c + stx2d, and stx2e + stx2f as shown in Additional file 5. The smallest fragment, of 39 bp, could not be visualised on the agarose gel, but this does not affect the interpretation of the results. Similarly, the 62 bp fragment produced from stx1 was not always visible. However, this fragment was not required for positive identification of stx1, which was specifically identified by the presence of the 334 bp fragment. The Enterobacterial Common Antigen (ECA) was first described in 1963 by Kunin  and is defined as a cross-reactive antigen that is detectable in all genera of Enterobacteriaceae by several methods including using antisera to E. coli . ECA was later found to be strictly family specific with diagnostic potential because of its universal presence in the family (see reviews ). Two of the genes implicated in the ECA synthesis are the rfe and rff genes [33, 34] later renamed wec . Immunology-based diagnostic tests have been developed to detect the presence of ECA for clinical applications  and later to monitor the quality of drinking water by probing for bacteria belonging to the Enterobacteriaceae family . In the PCR based protocols used here, the wecA primers detected all tested 23 strains of E. coli and S. dysenteriae. Eighteen varieties of intimin have been described  among which: α (alpha), β (beta), γ (gamma), δ (delta)  and ε (epsilon) . The eae gene is found in the locus of enterocyte effacement (LEE) pathogenicity island of both EPEC and EHEC [41, 42]. In the present study, all 6 tested EPEC were eae-positive as well as 11 EHEC out of 13 tested. Of the two negatives, EHEC O113:H21 has also been reported eae-negative in a previous study . Among the two stx groups, the second, stx2 and its five variants, is the most diverse and includes the most potent Shiga toxins for humans. Both stx2 and stx2c are mainly hosted by STEC associated with the aetiology of severe human diarrhoea whereas stx2d has been isolated in STEC from human as well as cattle origin . Finally, stx2e is found in porcine STEC  while stx2f is found in STEC hosted by birds [46, 47]. Although the toxins Stx2e and Stx2f seem to be adapted to their respective hosts, both have been associated with human disease [45, 48]. Swine was also shown to harbour STEC carrying stx1 and stx2d associated with human infections , a finding which further underlines the importance of establishing screening methods designed for detecting all variants. The results obtained for stx in the present study were in agreement with expectations. All three S. dysenteriae were positive for stx by triplex PCR and further confirmed to harbour stx1 by both semi-nested duplex PCR and enzymatic restriction. Among the 13 EHEC strains, 11 were found stx positive by triplex PCR. Strain ATCC 43888 was stx-negative as expected whereas strain 3005/00 was unexpectedly stx-negative although eae-positive. This could be the result of loss of the virulence factor as it has been previously demonstrated for stx both in vivo  and in vitro . Three EHEC strains were shown to have both stx1 and stx2, confirmed by both the semi-nested duplex PCR and the enzymatic restriction typing method. In particular, strain BE97-2317 was shown by enzymatic restriction to harbour stx1c, a gene coding for a toxin type also previously found associated with EHEC O128:H2 and negative for eae . Various universal primer pairs for the detection of stx have been described in [52–59] some which overlap with the Ustx primers employed in this study (Additional file 3). However, few primers are able to detect all variants and are used in a multiplex assay [60–62] or also have integrated an IAC such as E. coli detection . Integrating the detection of an indicator group, expected to be co-detected along with the targeted virulence markers, has the advantages over using a traditional IAC that it will also be able to detect, not only PCR inhibition or failure, but also absence of DNA. Finally, the Enterobacteriaceae family has been described as a possible alternative to faecal indicator bacteria, as it can better reflect the hygienic status of food products , hence Enterobacteriaceae PCR assays should find several areas of applications. Overall, this simple molecular screening assay including its further typing possibility for stx, should help food and health authorities to increase their monitoring efforts to improve water and food microbiological quality as well as patient diagnostic capabilities. A limited number of strains were used for detection capability of the assay, and specificity testing for Enterobacteriaceae was not performed. Limit of detection has not been evaluated. MA and RS conceived and designed the study, MA performed laboratory work, analysed the data and drafted the manuscript, RS supervised the study and revised the manuscript. Both authors read and approved the final manuscript. We thank Anne Grændsen, The Norwegian Institute for Food and Environmental Analysis, for providing laboratory space to perform part of the laboratory work, Even Heir, The Norwegian Institute of Public Health, for providing pathogenic E. coli strains and Wenche Blix Gundersen, Rikshospitalet University Hospital, for providing Shigella dysenteriae strains. The work presented in this Paper was included in Patent WO 2003/052143, granted by the European Patent Office as EP1466011, and abandoned. As the related Patent WO 2003/052143 and affiliated, have been abandoned, the authors declare having no competing interests. All data is made available in this paper and additional files. This work was supported by a Norwegian NFR Normal Grant and NIVA. 13104_2018_3457_MOESM1_ESM.docx Additional file 1. Overview of qPCR protocols for detection of stx, eae, other E. coli pathogenic markers, serotyping genes and indicator markers. 13104_2018_3457_MOESM2_ESM.docx Additional file 2. List of strains with triplex PCR results. 13104_2018_3457_MOESM3_ESM.docx Additional file 3. Comparison of selected primers aiming at the detection of all variants of stxA gene; arrows are indicating the direction of the primers and complementary sequences are shown for the reverse primers. The conserved bases are shaded in black while the variable positions are unshaded. 13104_2018_3457_MOESM4_ESM.docx Additional file 4. PCR and BsrI digestion. Lane A, DNA size ladder; Lane 1 to 28, stx positive strains as listed in Additional file 2, odd numbers are the undigested stx products, even numbers are the digestion products. 13104_2018_3457_MOESM5_ESM.docx Additional file 5. Subtyping results for stx by restriction enzymatic digestion of the stx amplicon and semi-nested duplex PCR. Diarrhoeal disease. http://www.who.int/mediacentre/factsheets/fs330/en/. Accessed 4 April 2018.